The Earth’s average surface temperature has increased by about 1.8°F (1.0°C) since the late 1800s. Human-caused emissions are responsible for observed warming. Growing concentration of greenhouse gases from human activities is making this blanket thicker, and warming the planet. The world is undoubtedly warming. The Earth’s average surface temperature has increased by about 1.8°F (1.0°C) since the late 1800s. The 10 warmest years on record (since 1880) have all occurred since 1998, and all but one have happened since 2000. 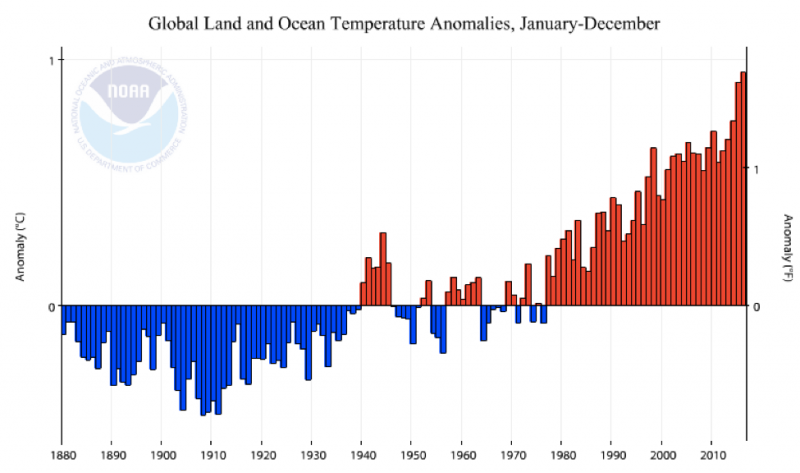 See a list of global average annual temperatures here. Light from the sun passes through the atmosphere and is absorbed by the Earth’s surface, heating it up. That energy is then emitted back to the atmosphere. Greenhouse gases [link to our webpage on them] in the atmosphere act like a blanket, absorbing this energy and preventing it from escaping into space. In the absence of a greenhouse effect, the average temperature at the Earth’s surface would be approximately 60°F colder. But the growing concentration of greenhouse gases from human activities is making this blanket thicker, and warming the planet. 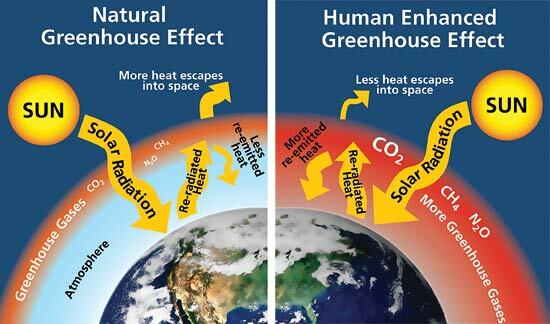 The warming of the Earth is largely the result of emissions of carbon dioxide (CO2) and other greenhouse gases from human activities. These activities include burning fossil fuels, such as coal and oil, and changes in land use, such as agriculture and deforestation. Carbon dioxide concentrations in the atmosphere have increased since pre-industrial times from 280 parts per million to over 400 parts per million. It is extremely likely that human influence is the dominant cause of the observed warming since the mid-20th century. 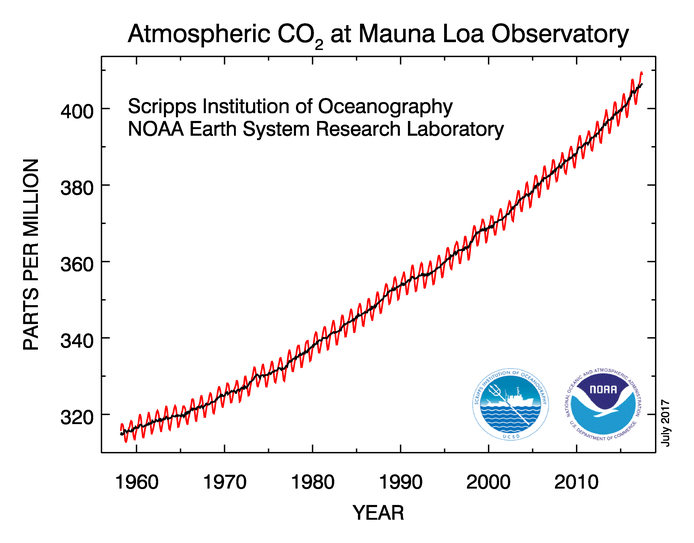 Atmospheric carbon dioxide from 1958-present. The red curve shows the monthly average. The black curve has been adjusted to take the seasonal changes in CO2 concentration into account. Source: Dr. Pieter Tans, NOAA/ESRL and Dr. Ralph Keeling, Scripps Institution of Oceanography. The reason for the accumulation is simple: Human activities are emitting more carbon dioxide than the planet’s natural processes (uptake by plants and the ocean) can remove. It’s like a bathtub where the flow of water out of the faucet is more than the flow through the drain. This 5-minute video by the National Academies of Sciences, Engineering, and Medicine shows the many lines of evidence that human activities are causing greenhouse gases to increase. Ice cores from Greenland and Antarctica tell us that carbon dioxide and other greenhouse gas concentrations were relatively stable for thousands of years, but began to rise around 200 years ago, about the time that humans began to engage in very large-scale agriculture and industry. Concentrations for these gases are now higher than at any time for which we have ice core records, which stretch back 800,000 years. Some greenhouse gases, such as industrial halocarbons, are only made by humans. Their accumulation in the atmosphere can only be explained by human activity. Carbon dioxide from fossil fuels has a certain isotopic “signature” (an indication of atomic weight) that differs from other sources of CO2. Scientists measure the different isotopes to confirm that the increase in carbon dioxide in the atmosphere is predominantly from fossil fuel combustion. Other factors capable of changing the climate, like volcanic eruptions and changes in the sun’s intensity, cannot by themselves explain the changes we’ve observed in the Earth’s climate. The figure below shows the outcomes of different computer simulations of climate (see caption for details). Only the simulations that included human influences exhibited warming similar to the observed temperatures around the globe during the last century. Observed (black lines) and simulated (shading) surface temperatures, ocean heat content, and sea ice extent. 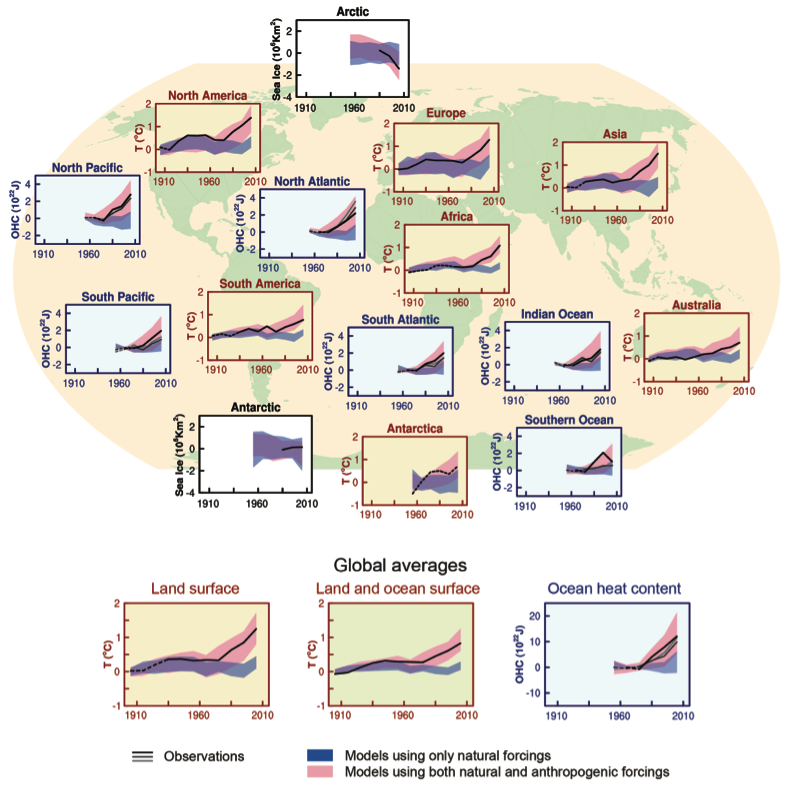 The blue shading represents simulations without humans’ influence on climate, and do not match the globally-average observations or those over most continents. The pink shading represents simulations where greenhouse gas emissions and other human influences have been taken into account – these simulations do a much better job at tracking temperatures and ocean heat content globally and regionally.